Cosmo Iovine first appears in Painesville, Lake County, Ohio in 1929. When Cosmo immigrated to the United States, Painesville, Ohio, was his destination. He immigrated at age 3, with his mother and siblings. Cosmo Iovine, son of Angelo Iovine and Maria Colarusso, was born on September 17, 1925, at Frosolone, Isernia Province, Molise, Italy. Cosmo married Mary Jane Balland, daughter of Dewey Balland and Phyllis Lathrop, on August 7, 1952, at Lake County, Ohio. He was widowed by the death of his wife, Mary Jane Balland, in 2011. Cosmo Iovine died on December 30, 2016, at Brookdale at Newell Creek, Mentor, Lake County, Ohio, at age 91. Cosmo Iovine immigrated to the United States on August 5, 1929, at age 3. He was travelling to 120 Sanford Street, Painesville, Lake County, Ohio, to join his family’s father, Angelo Iovine. Cosmo immigrated with his mother and siblings to America. They arrived in the United States at the Port of New York City aboard the ship SS Grande Conti. Cosmo Iovine was enumerated for the 1940 Census of the United States, on April 6, 1940, living at 125 Prospect Street, Painesville, Lake County, Ohio, as a son of Angelo Iovine. Cosmo served in the Army of the United State during the Korean War. Mr. Iovine retired from the Diamond Shamrock Company in 1983. 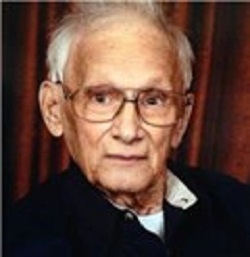 A private memorial mass will be held for Cosmo A. Iovine, age 91, of Concord, at St. Gabriel Catholic Church, 9925 Johnnycake Ridge Road, Concord Twp. Born on September 17, 1925 in Frosolone, Italy, Mr. Iovine passed away peacefully on December 30, 2016 at Brookdale at Newell Creek in Mentor. Cosmo retired from Diamond Shamrock in 1983 as a Plant Engineer. He was a member of St. Gabriel Church. He was a real people person and enjoyed spending time with his family, helping others, and always lending a hand. In the early years at Diamond Alkali, Cosmo and his co-workers, who were like family, would help each other build homes. He also enjoyed boating, gardening, working with his hands, and making wine. He served in the U. S. Army during the Korean War and was a member of VFW Post 7754 in Fairport Harbor. Cosmo is survived by his daughters, Susan (Ronald) Melaragno, Vickie Luster, and Michelle (Fergus) Bushe; grandchildren, Jonathon Luster, Fiona Bushe and Claire Bushe; sister Mary Sue (Ronald) Brence. He was preceded in death by his wife, Mary Jane (Ballard) Iovine in 2011; brother, Leonard Iovine; sister, Mayme Grasso; parents, Angelo and Mary (Colarusso) Iovine. In lieu of flowers, contributions may be made to Hospice of the Western Reserve, 5786 Heisley Road, Mentor, OH 44060.